Activision is once again excavating the Pitfall franchise, this time for an all-new adventure on the Wii called Pitfall: The Big Adventure. Fair enough. 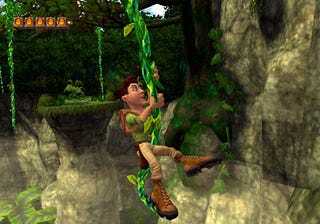 The game is under development by Edge of Reality, creators of Pitfall: The Lost Expedition for the PS2 as well as Sega's upcoming Hulk game. The title will feature over 60 levels of adventuring utilizing the Wii controls as you would expect for a guy who made his name swinging on vines. "Pitfall is one of the most legendary franchises in the history of videogames, so we look forward to releasing a new version exclusively for Wii," said Dave Oxford, Activision Publishing. "What could be more fun than using the Wii Remote™ to swing on a vine over blood thirsty crocodiles as retro-cool Pitfall Harry?!" Aw crap, you had me until you tossed the phrase retro-cool in there. You can't pull off retro-cool unless your Pitfall Harry is a bunch of blocks on top of each other running through fully-rendered 3D environments. Now there's a game I'd buy in a heartbeat. Pitfall: The Big Adventure is headed your way this Fall. SANTA MONICA, Calif.—(BUSINESS WIRE)—Activision, Inc. (Nasdaq: ATVI) announced today "Pitfall: The Big Adventure" for Wii™ is in development at Edge of Reality and will swing onto shelves this Fall. With more than 10 million Pitfall titles sold to date, Pitfall: The Big Adventure will introduce the franchise to a new generation of gamers while bringing a fresh Pitfall experience to long time fans. Set in the Peruvian jungle, Pitfall: The Big Adventure combines the action of reptile dodging and vine swinging with clever puzzles. The game will feature over 60 levels spanning lush rainforests, creature-filled caves, and glacial mountains. Within these dynamic worlds, players will explore cavernous jungles, discover lost treasures, battle shamen, narrowly escape treacherous traps and outwit creatures using innovative, accessible game mechanics developed specifically to take advantage of the Wii motion sensing controls. "Wii is a natural and perfect fit for a Pitfall game, and it's been fantastic to revolutionize this classic franchise through the application of the innovative Wii game mechanics. It's a completely new experience for the gamer," said Binu Philip, President, Edge of Reality.